Institute of Banking Personnel Selection (IBPS) invited application for recruitment to the posts of Officers (Scale I, II and III) and Office Assistants (Multipurpose). Institute of Banking Personnel Selection (IBPS) invited application for recruitment to the posts of Officers (Scale I, II and III) and Office Assistants (Multipurpose). The online examination for the Common Recruitment Process for RRBs (RRBs – CWE-IV) for recruitment of Group ‘A’- Officers (Scale-I, II & III) and Group ‘B’- Office Assistants (Multipurpose) will be conducted in September 2015. The candidates eligible for the post can apply through prescribed format before 28 July 2015. 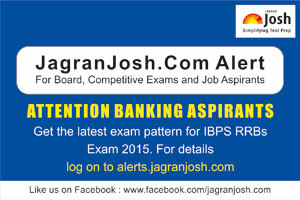 The candidates who will apply for the examination can take a look at the entire exam pattern. Knowing the exam pattern will help aspirants to prepare better for the exam. It will save their time and effort while preparing. The article consists of the entire exam pattern for the appearing aspirants to know.